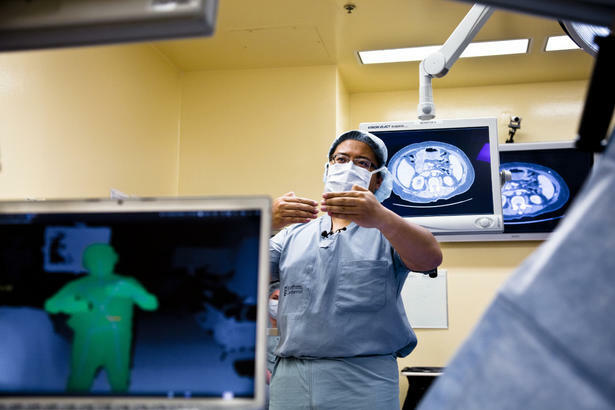 Scientists may be opening up the lucrative medical devices market to consumer gadgets companies with a group of Toronto doctors using Microsoft’s Xbox Kinect in the operating room. Dr. Calvin Law and his team at Toronto’s Sunnybrook Health Sciences Centre use Microsoft’s Kinect video game sensor during cancer surgery to view critical patient imaging. The hands-free device means Dr. Law doesn’t have to leave the sterile field around the patient to view MRI and CT scans. It’s like having a GPS navigator in the operating room, said Dr. Law who has used the technology in six liver cancer surgeries in the last month or so. Before the innovation, Dr. Law had to leave the sterile field around the patient, put on another pair of gloves, review images on their computer, memorize the data, re-sterilize and return to the operating table. Dr. Law said the Kinect fills a hole in his team’s needs. Hospitals have invested hundreds of thousands in the latest and greatest imaging over the years but access from the operating room remains a problem. “Because there’s no computer than can be sterile or clean,” he said. To date, Microsoft remains on the “periphery” of the multi-billion dollar healthcare solutions industry, said John Moore, a health IT analyst and blogger at Chilmark Research in Cambridge, MA. But the company is making inroads into the hospital business, he said. Last week, the Redmond, Wash.,-based company said it launched its Sentillion healthcare products in Asia, a year after acquiring the computer program company. The Xbox maker is not alone. “Sony has been poking around into the market” testing out its consumer-type products in healthcare settings, Moore said. Cisco is making a name for itself in hospital room teleconferencing. And many doctors are using Nintendo’s Wii for physical rehabilitation therapies. Still, the biggest players in Canada’s $6.4-billion medical devices remain companies like Johnson & Johnson, General Electric Healthcare, Siemens and Phillips. Matt Strickland, a general surgery resident at University of Toronto and engineer adapted the Kinect for the OR with Jamie Tremaine, a mechatronics engineer and Greg Brigley, a computer engineer. They hooked up the Kinect sensor to their own computer allowing the surgeon to view scans of the patient from a suspended monitor by making gestures in the air, without having to leave the all-important sterile field. Stickland said Microsoft purposefully chose not encrypt the Kinect stream of data so that it could be used as an open source in a whole host of applications like assistance for the blind and robotics.